"It's kind of hard to think of yourself as a duchess when you're sleeping on a damp floor. But sure, yeah, I guess every lonely girl would hope she's a princess." The fate of Russian princess Anastasia was one of the great mysteries of the 20th Century (at least until DNA testing settled the issue once and for all), but it's probably safe to say that no other oddball conspiracy theory about the young girl's whereabouts in the wake of the October Revolution and the slaughter of Czar Nicholas' family in 1918 included the walking corpse of Rasputin, a talking bat, and quite so many glossy production numbers as Don Bluth and Gary Goldman's 1997 animated musical, Anastasia. The directors admit the dark, rather adult tale is an odd choice for an animated film, but, strange as it seems, it works. Playing loose with history, using the 1956 Ingrid Bergman film as a rough outline, and incorporating every element of the '90s-era Disney formula (epic scope, flashy villain, plucky heroine, cute animal comic relief, and opposites-attract romance), the co-directors, ex-Disney animators themselves, crafted one of the best traditionally animated American films of the decade. It is the Czar's magician and advisor Rasputin (Christopher Lloyd) who is credited with overthrowing the rule of the czar in an intense prologue. Humiliated by the royal family, the wizard vows revenge, and soon enough, Marxists are breaking down the gates and slaughtering (off-screen, of course) the family. Young Anastasia (Kirsten Dunst) escapes, but is separated from her grandmother at the train station. A decade later, 18-year-old Anya (Meg Ryan) has no memory of her life before age eight, when she was found wandering in the streets of St. Petersburg and sent to an orphanage. Wily conmen Dimitri (John Cusack) and Vlad (Kelsey Grammer) notice her unmistakable resemblance to the missing Princess Anastasia, and rope her into a scheme to convince the surviving Grand Duchess (Angela Lansbury) that her granddaughter is still alive. But as they coach Anya in the ways of the Czar's court, she begins to suspect that her dreams of palaces and lavish balls may be more than mere fantasy. Meanwhile, in the underworld, the fact that he's dead has not stopped the immortal Rasputin from plotting against the Romanovs�conditions of a pesky curse keep his spirit trapped in a body that's literally falling apart until the last of the family line is wiped out. With the help of his anachronistic, comedic bat sidekick Bartok, Rasputin vows to finish the job he started ten years earlier. The story is familiar even if you haven't seen earlier versions�Anya is the typically plucky heroine, and her smart-mouthed banter with Dimitri hints at the expected third act romance. Rasputin, his limbs popping off in all directions, is played for laughs as much as menace, and Bartok the bat, voiced by Simpsons veteran Hank Azaria, is as charismatic as Robin Williams' Genie in Aladdin, so much so that he was given his own direct-to-video sequel. But the fact that the movie follows a formula doesn't mean it isn't entertaining, and Anastasia balances action, romance, drama, songs, and comic relief better than most. Technically, though, it has some rough spots. The character designs are somewhat awkward�Anya and Dimitri look realistic, while the rotund Vlad is quite cartoonish�and their movements sometimes appear stiff and awkward, their gestures far too broad. Computer animation lends an epic scope to many scenes, and the elaborate 3-D backgrounds are always impressive, but the effect is less convincing when CGI props are blended with the traditional animation�witness Anastasia's music box floating weightlessly in her hands. Those issues aside, this is still a vibrant and imaginatively animated film. It's the more subtle visual trickery that brings songwriters Lynn Ahrens and Stephen Flaherty's production numbers to life. As Anya wanders through the deserted Romanov palace, the mournful Once Upon a December brings a hundred spectral dancers to life. Later, Anya and Dimitri travel inside a watercolor painting to sing Paris Holds the Key (To Your Heart). As you might suspect from the subject matter, Anastasia will appeal most to an older crowd than typical animated fare, but it's a wonderful, quite underrated musical that deserves a second look. Image Transfer Review: Previously released in the early days of Fox DVDs, Anastasia is presented here for the first time in anamorphic widescreen, and the transfer is beautiful. It's crisp and detailed, with bright, solid colors and no distracting edge enhancement. The source print is clear of dirt and dust as well. Audio Transfer Review: The audio mix is almost as impressive�speech is clear and natural, and the songs sound rich and full, with lots of input from the surrounds. The action sequences, including a train crash, are also very active, and feature a lot of LFE. 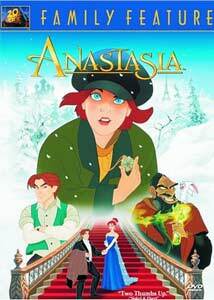 Extras Review: Anastasia's return to DVD is billed as the "Family Fun" edition, and as you might imagine, that means a mix of extras aimed at audiences young and old. On Disc 1: Don Bluth and Gary Goldman contribute a frank commentary that's more enlightening than it is entertaining. They discuss the production in detail, focusing mostly on the technical craft of animation, and they spend a lot of time pointing out things they don't like or wish were better. Bluth in particular criticizes the "acting" of the animated characters, and on that, I agree with him�the characters are all realistically drawn, so it's really obvious when their motions don't "read" as particularly lifelike. It's something that bothered me about their follow-up, Titan A.E. as well. Nice to hear such candor on a commentary instead of the usual platitudes. A Learn to Draw segment (28m:53s) with Bluth is about as helpful as every other "learn to draw" segment ever (i.e., not at all), but it's interesting to see the animator at work anyway. There's also a sing-a-long for two songs and Anastasia's Music Box Favorites (24m:43s), which collects musical sequences from Anastasia, some Shirley Temple movies, Ferngully: The Last Rainforest, and even Young Frankenstein. Weird. Disc 2 holds the rest of the bonuses, most of which are aimed squarely at kids, starting with the animated, narrated menus, which require you to navigate the Romanov castle and click on this or that to find the bonuses. It's a neat idea for kids, though, thankfully, there's an option to simply choose from a list of them as well. The most significant extra is, I suppose, the inclusion of the direct-to-video prequel, Bartok the Magnificent, presented in the original full frame and English, French, and Spanish DD 2.0. The 67-minute film, directed by Don Bluth, has its own menu screen and is divided into 16 chapters. As a movie, it's cute�Hank Azaria returns as the smooth-talking bat, and songwriters Stephen Flaherty and Lynn Ahrens contribute another bouncy song score�but it's definitely for the younger set, and the animation quality is a noticeable step down from the parent production. Still, it's certainly a worthy extra feature. Animation buffs will want to check out the six-part The Making of Anastasia, made up of six featurettes with a total running time of around 45 minutes. This newly produced piece provides an intelligent look at the process of making an animated film, with input from Goldman and Bluth and lots of vintage footage of the animators and actors at work. The voice cast also participates via talking head clips circa 1997, which are less interesting. Segments include The Story, The Research, The Look, Designing Characters, The Voices, and The Music. The International Phonetic Alphabet Sing-a-long is just weird; songs are presented in several different languages, with the lyrics in each spelled out phonetically at the bottom of the screen so kids can sing along. Useful if, when visiting, say, Brazil, you want to ask if anyone has heard about the rumor in St. Petersburg. Elsewhere, the late Aliyah's music video for Journey to the Past is paired with a "making-of" that is really just an interview. Games and activities include three "fun" remote clicking adventures, Anya's Day Out, a dress-up activity like digital paper dolls); Rasputin's Revenge, which requires you to catch the evil sorcerer's body parts as they fall off; and Help Anya Remember, movie trivia (is it sad or scary that I was able to answer all the fairly specific questions correctly before watching the feature again for the first time in six years?). Anastasia is the best non-Disney animated movie ever to follow the Disney formula, and a good sight better than much of what the mouse house produced in the 1990s. It's hardly historically accurate (communism spurred on by magic spells! ), but it's a great musical comedy. This new "Family Fun" edition is a bargain for the anamorphic transfer alone; the included sequel is just a bonus.